Bavarian Inn Lodge Review by Becky Fixel | Escape to Little Bavaria - A Stay at the Bavarian Inn Hotel! If you drive about twenty minutes north of the Metro-Detroit area you’re in another world. The hustle and bustle isn’t there, and you can find a lot of unique destinations. About an hour and a half north of Detroit you will find Frankenmuth – Michigan’s little Bavaria. 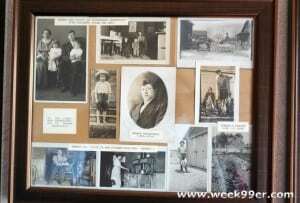 A town originally settled by a small group of German families, and that still keeps some of the old traditions and charms in tact. All through my high school years I studied German, and each year we’d take a field trip to Frankenmuth. We had an obligatory trip to Bronners, where it’s Christmas year round, and at least one other stop along the way. But until a friend was married at the Bavarian Inn a couple years ago, I never explored Frankenmuth beyond the main street. My family and I were invited to be guests at the Bavarian Inn hotel and have the full experience including a meal at the Bavarian Inn restaurant. I figured this was the best time to see the city, and not be on the time table the high school trips gave us. Our hotel room was a standard double room, and had what you would expect in it. Two queen size beds, a small bath, a coffee pot, a mini fridge and a small desk. But all rooms also include a deck or patio area with seating and a sliding door. Our room overlooked the Cass river, so we could watch as the paddle boat went up and down or watch the birds go by. 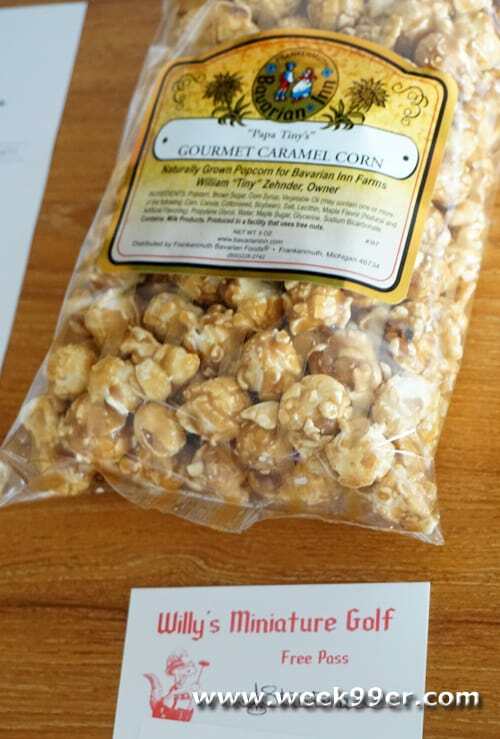 We were also pleased to find caramel corn and vouchers for mini golf waiting for us! The Bavarian Inn hotel is more than a hotel, inside the hotel you will find Oma’s Restaurant, shops, a huge arcade, a private pool for guests and a larger pool area that passes can be purchased for if you have people visiting you. There is a pizza place in the lower level as well, situated between the putt putt area and part of the arcade. The fun zone is open all day for tourists and friends, but remains open for hotel guests until 11 pm. Each room in the hotel is named for one of the founding families of Frankenmuth. 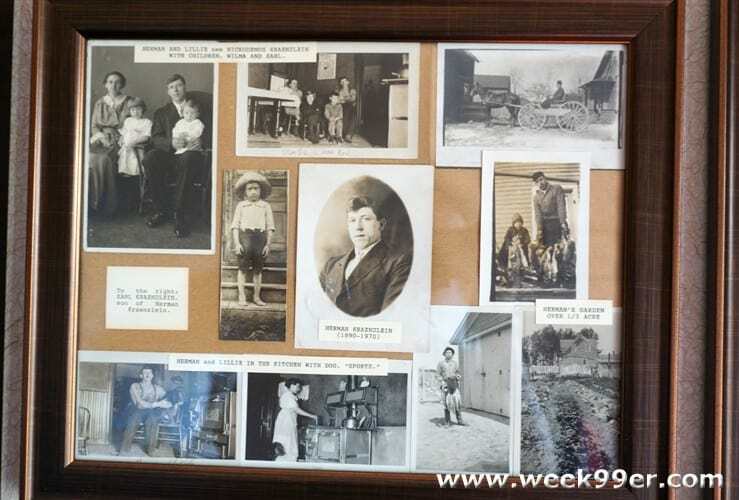 Not only will your room have a unique name, but inside you will find images from the family that it was named for including marriage certificates, wedding photos and a story about the family. This brings a personal touch to the room, and makes each stay unique since it will be hard to get the same room twice! Our stay at the Bavarian Inn was nice. 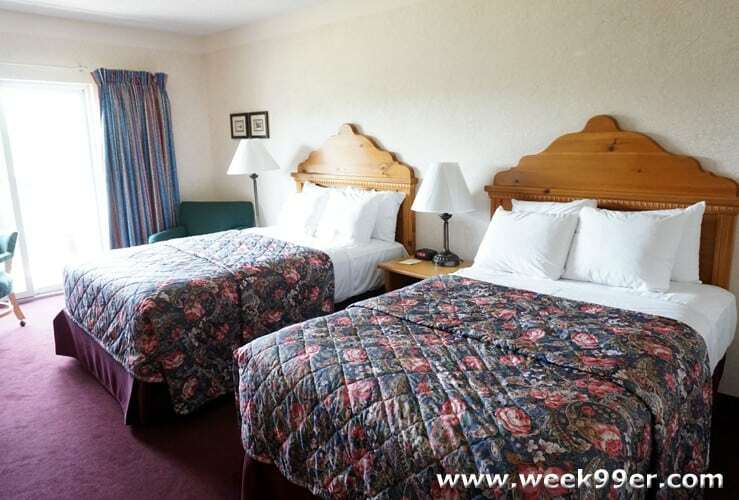 The rooms are comfortable and what you’d expect in a tourist area, the beds were great when we came back exhausted. From the hotel, you can easily walk to the River Place Shops, or to downtown Frankenmuth. It’s a shopper’s dream! You can easily find chotchkies, clothing, freshly pulled taffy, handmade fudge, fresh cheese, and don’t forget some of the best chicken in the world! Your feet will get sore from walking, but there are free shuttles back to the hotel, or you could rent a horse and buggy. It was nice staying and spending some time in Frankenmuth, checking out what there was to offer. It’s a nice little taste of Germany and the Bavarian culture, and only a short drive from the metro area. Right now there’s a deal at the Bavarian Inn where my readers can receive up to $35 off their Stay! Any Pool Access, Pool Level or Suite OR $25 OFF – Any Standard or Balcony Guest Room (w/Two Double Beds or One King Bed) Code #1239JD Call (855) 421-1366 Or use This digital Coupon to Save at the Bavarian Inn!